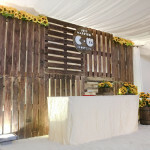 The backdrop and decoration was excellent and Emad was the most helpful and reliable vendor amongst all my wedding preparation vendors. Thank you so much! !